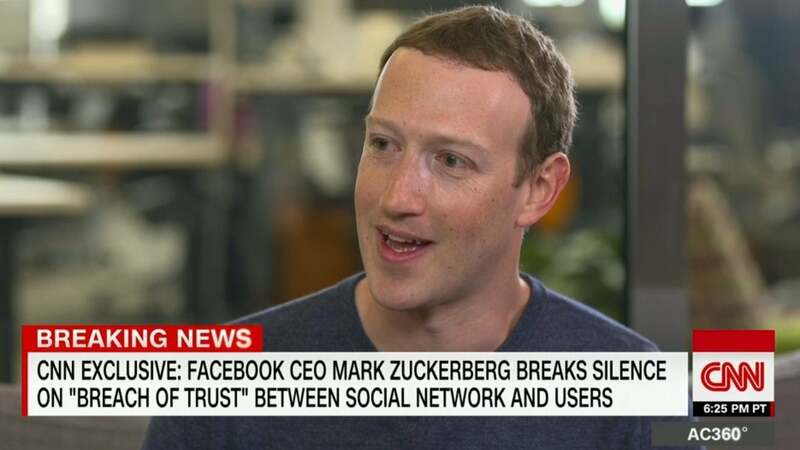 Facebook CEO Mark Zuckerberg, fresh off of not apologizing for the social media giant's failure to prevent sketchy election data firm Cambridge Analytica from partnering with a similarly sketchy app to allegedly scrape 50 million users' profile data, briefly emerged from his gilded panic room on Wednesday evening for an interview with CNN's Laurie Segall in which he largely repeated his PR department's talking points. With all the charm of an awkward teenage robot in a wig, Zuckerberg finally clarified that he was "really sorry that this happened." He reiterated that he believed the company made big mistakes, first by allowing app developers far too much access to user data in previous builds of the site, and later by blindly trusting that Cambridge Analytica and other companies involved would actually delete it just because they sent them a sternly worded letter. Zuckerberg committed to notifying all impacted users that third parties may have run off with their data. But the longer the interview dragged on, the more it seemed like Zuckerberg didn't really have a good answer to anything and just wants this whole mess to blow over. For one, though Zuckerberg repeatedly promised that Facebook would conduct a "full forensic audit" of which apps may have gained access to user data without their full consent before tighter rules took effect in 2014, he was unable to offer any details on if other companies had absconded with user data. When asked whether he would be willing to testify before Congress, Zuckerberg passed the buck to unnamed other staffers, saying he was "happy to if it's the right thing to do," but "what we try to do is send the person at Facebook who will have the most knowledge." OK, so Zuckerberg isn't the person most in on the loop on the scandal that recently shaved around 8.5 per cent of his company's stock price so far this week. Got it. If you'd told me in 2004... that a big part of my responsibility today would be to help protect the integrity of elections against interference by other governments, you know, I wouldn't have really believed that was going to be something that I would have to work on 14 years later... But we're here now, and we're gonna make sure that we do a good job at it. For the record, 2004 is the same year Zuckerberg bragged to a friend via DM that he had access to the data of all the "dumb fucks" who had signed up for the initial version of the site, so perhaps he was not quite the naive fawn he would like us to think. Anyhow, Zuckerberg then immediately conceded that in 2016, Facebook did not do a good job at protecting its community from alleged Russian interference in the lead-up to the November federal elections. He also rattled off a number of major world elections that the company is planning to use more "AI tools" to protect, which does not exactly sound reassuring given Facebook's recent track record. In other words, the guy came across as a little overwhelmed with the responsibility of running his massive international data-hoarding conglomerate, and more than a little like he didn't appreciate having to go on camera about it. Given that some of his answers on CNN were nearly identical to ones he separately gave the New York Times, this is probably how he sounds even after heavy coaching. No wonder he doesn't want to testify before Congress. So my understanding with food safety is there's a certain amount of dust that can get into the chicken as it's going through the processing, and it's not a large amount - it needs to be a very small amount - and I think there's some understanding that you're not going to be able to fully solve every single issue if you're trying to feed hundreds of millions of people — or, in our case, build a community of 2 billion people - but that it should be a very high standard, and people should expect that we're going to do a good job getting the hate speech out. And, just in case the CNN interview wasn't softball enough, Segall gave Zuckerberg the chance to conclude by fielding a question about how fatherhood has changed his views on all this. "Now, you know, I really just care about building something that my girls are going to grow up and be proud of me for," Zuckerberg told CNN. "That's what is kind of my guiding philosophy at this point is, you know, when I come and work on a lot of hard things during the day and go home and just ask, 'Will my girls be proud of what I did today?'" Spoken like a man who totally knows what he's doing, relates to others' concerns on a natural emotional level, and could totally handle a few members of Congress if he needed to.